Reference number for this case: 16-oct-54-Maubeuge. Thank you for including this reference number in any correspondence with me regarding this case. This field ufologist investigated the case shortly after the events, and interviewed again the witnesses 16 years later to make sure that they had not changed their story, they did not. He published a report on the case in the French ufology magazine "Lumières Dans La Nuit," the report gives the following information. Between Avesne and Louvroil, in the vicinity of Maubeuge on National Road RN 2 which joins Paris and Brussels in Belgium, on October 16, 1954, at about midnight, Mr. and Mrs. Mozin were driving back from a visit to relatives in Dourlers. The road was empty, it was cold and dry, almost freezing, the sky was clear, they drove at a speed of 120 km/h. M. Mozin indicates to his wife on gleams in the countryside, on top of a small hill, at a distance which they estimated at 800 meters away. Mr. Mozin tells his wife that he thinks that there has been a car accident. The distance is quickly covered by their car and when they are at the top of the hill, they discover at 100 meters away on the right side of the road a craft on the ground, which has a cylindrical form of two meters in diameter with a cone of low height at the top. The witnesses experienced that when their car was still at a hundred meters of the object, the headlights of the cars died out spontaneously while the engine continued to function normally. Mr. Mozin however slowed down at this time and brought the speed to 70 km/h. While continuing to drive they arrived at some four or five meters of the object. They can then see that it is resting on feet. The feet seem to have some thirty centimeters in height. It has a white aspect like coated metal sheet and vertical lines separated by 10 centimeters on its surface. The craft has a broad opening, and in this opening, which seems deprived of a door, a silhouette appears to move slowly. They thought it was quite similar to the well-known silhouette of the "Michelin dummy." This being seems to have a height of one meter and twenty centimeters, very large, broad of 0m90 to 1 meter, with rolls around the arms and legs, and carrying a bulky helmet almost as broad as its shoulders. Its face is not distinguished. It seems to move slightly and very slowly, like if getting ready to come out, trailing its feet which appear fitted heavy boots. Its hands are not visible. The luminosity of the opening diffuses on the road, the interior of the machine seems of an intense white but not dazzling. Some sort of conduits or large cables go down in the machine in its interior and some sort of handles or switches are seen. When the car passed the object by a hundred meters, its headlights functioned again spontaneously. Mr. Mozin then stopped the car, as he gad decided to walk to the object for a closer look, but his frightened wife dissuades him and they drive away and return to their home in Maubeuge. They thus did not see a departure of the craft. The next day, Mr. Mozin, while going to Rheims to attend a fussball game with his friend Mr. Houssière, stops at the place where he saw the object the day before to check if there are any traces left, hoping to prove to his friend that he did not dream. In a narrow space between a one meter broad and 50 centimeters deep ditch and the road, three 8 to 10 centimeters deep prints in half rings were visible with, in the center of the imaginary circle formed by these three prints of approximately a meter forty, a carbonized round, 20 centimeters in diameter, releasing an odor that the witness compared to that of benzene. The car had to pass at between three and five meters of the object. The gendarmerie did not carry out any investigation and Mr. Mozon's friends made fun of him, estimating that it was all a big joke, but the witnesses never forgot the incident. Mrs. Mozin suffered from insomnia during eight days and imagined the Michelin "bibendum" near her bed at night. J.M. Bigorne re-interrogated the witnesses 16 years after the facts. He notes that the witnesses had both a good sight, did not suffer from any disease and were favorably known in their vicinity for their kindness and good morality. Mr. Mozin remained very calms in connection with this event, while Mrs. Mozin insisted that she would rather never had lived such a frightening experience. Drawing from "Lumières dans la Nuit." Bibendum, the "Michelin man", an advertising symbol of this tyres trademark. The authors indicate that the event occurred around Maubeuge, on the R.N. 2 (Paris-Brussels), between Avesne and Louvroil (Maubeuge), Michelin map #53, fold 6, and was the subject of an investigation by ufologists Bigorne and Mathieu. One Saturday of November 1954, the Mozin couple had visited a patient at parents in Dourlers. About midnight, they were on the road back in direction to Maubeuge. The road was deserted, the weather was dry, rather frozen and it was clear. They drove at a good pace, when Mr. Mozin said to his wife: "Hold on, look at the gleams over there! What is it? You would say a serious car crash!" The gleam was at the top of a small hill at approximately 800 meters of their car. While driving at 120 km/h, they quickly crossed this distance and arrived at the top of the small hill and from there they saw within 100 meters on the right side of the R.N. 2, a machine posed with an opened door, and inside the machine a "Michelin guy" appearing to move slowly on the threshold of this door. The craft had the form of a sort of large shell and rested on feet. It had a white metallic aspect, of coated sheet aspect, and on the walls were visible, vertical lines at intervals of 10 cm. The being was high of 1.20 meters approximately, very fat, with rolls around the arms and legs. Fitted with large boots, it had a bulky helmet, almost as broad as its shoulders, which made him a large head. The seen light came from the opened door, and was diffused on the road. The interior was of an intense white, not dazzling. The two witnesses saw there what they supposed to be pipes, or large cables, which went down in the machine, with kinds of handles or switches. The Mozins managed to begin their observation a hundred meters before arriving close to the object, where they passed in the immediate vicinity, i.e. to 4 or 5 meters. The headlights of the car ceased functioning as soon as they were at a hundred meters, at the time when the witnesses saw the object. The engine did not stop. The driver then slowed down, and it is more slowly than it crossed the machine: at 70 km/h approximately. A hundred meters after, the headlights suddenly re-ignited without his intervention. Mr. Mozin stopped in the intention to go to see the strange object more closely, but due to the insistence of his frightened wife, he resumed his trip towards Louvroil and reached their home in Maubeuge. The following day, a Sunday, going to Rheims to attend a fussball game with his friend Mr. Houssières (deceased, [in date of publication]), he stopped at the place of the landing to seek traces, and to prove to his skeptical friend that he had not dreamed. Three prints were visible, and in the center of the triangle which they formed, there was a carbonized round of 15 to 20 cm of diameter releasing an indefinable odor, reminding of benzine. The three traces were laid out on a circle of more or less 1.40 meters of diameter, and were in the form of half-circle, deep of 8 to 10 cm. The spacing of the traces seemed smaller than the diameter of the craft evaluated as of 2 meters. The craft was posed on a narrow space between the ditch and the road. All the friends of Mr. Mozin laughed at what they thought of being an enormous joke, and the gendarmerie did not intervene. The witnesses never forgot that night, it remained engraved for ever in their memory. Mrs. Mozin suffered from insomnia during eight days, and she still saw the "Michelin bibendum" at the foot of her bed. Each time that she saw a gas station with the Michelin advertisement she reminded her husband of their strange encounter. The authors specify that the credibility to be granted to this account appears complete. The Mozina were known in their vicinity for "their kindness and their good moral and intellectual behaviour. They are simple people to whom a cat is a cat; and a flying saucer a flying saucer." They enjoy a very good sight and never had any serious illness. Sixteen years afterwards, day for day, the witnesses acted their adventure for the investigators, who indicate that their account has notes of sincerity which would be quite difficult to fake. They became again astonished, curious or apprehensive and, on the contrary to her husband, the wife stated that she would not like to see that any more, as she had been so much frightened. Mr. and Mrs Mozin were interviewed by André Darcheville for a radio broadcast of 1974 on the french national radio France Inter. [Voice] - "We will begin the approach of the humanoïdes, thanks to found witnesses, who agreed to entrust their fantastic adventure at the microphones of France-lnter. So, Mr. and Mrs. Mozin who tell one of our reporters, André Darcheville, what they saw in November 1954..."
[M. Mozin] - "I was returning from Montournère. Arrived at the "Belle Hôtesse", at the top of the coast, I saw very sharp lights on the roadside. To me, this was an accident. I was within two kilometers approximately of these huge lights: I thus accelerated. I descended the hill very quickly, to see the accident. Within a hundred meters, suddenly, my headlights die out! I was driving at 120 km/h. At this point in time I saw the being." [A. Darcheville] - What did it look like?" [M. Mozin] - "It resembled the bibendum of the Michelin publicity. A large helmet, large gloves, boots, a size of an average man. Its silhouette cut out in a door which made about 1 meter 80 high. Behind the door I saw like controls, sort of stems and electric wires. It should be said that all was perfectly lit, very white. You could see a in daylight. I thus passed in front of the machine. Fifty meters further, the light came back in the car. The headlights again functioned normally. A little further, I stopped because I wanted to go back there. At that time, I had a revolver on board. I said to myself: "We'll see." My wife started to shout: "No, I do not want to go there!" So, I continued. The following day, I was to go to assist a football game, in Rheims. I was the president of the U.S.M., here in Maubeuge. I was go there with a friend, a tobacconist. He died since, otherwise he would have testified. Before leaving I told him: "Yesterday evening, I saw a saucer!" He answers me: "It's not true!" "Good, since you don't believe me, I will show you while going to Rheims." We hit the road, and arrived at the place in the basin, we get out of the car. I show him the ground. Indeed, there were traces. "Looks at this: there are three naked feet, one there and another there and in the middle, that's odd!" My friend was amazed. "It's true, I lost!" he answered me." [A. Darcheville] - "You did bet with him?" [M. Mozin] - "I bet a bottle of champagne and a supper. And I won." [A. Darcheville] - "Let's go back to this famous night. What was the shape of the craft of have seen?" [M. Mozin] - "It had the shape of a cigar of three meters in diameter. The door in which the little man was seen had about a meter eighty of height. There remained a space of approximately fifty centimeters between the top of the door and the head of the being. This being, I saw him move. He was going to get out at the time when I arrived. It walked like this. He had difficulties moving. In my opinion, the objects which he had on him were very heavy." [A. Darcheville] - "The inside was brightly lit I believe, did you see it well?" [M. Mozin] - "The interior was illuminated with an exceptional strength. White, very white, like those chairs over there." [A. Darcheville] - How long have you seen it? [M. Mozin] - "It happened very fast, about fifty seconds." [A. Darcheville] - "Mrs. Mozin, what impression did it make on you?" [Mme Mozin] - "I was afraid! All that I can say, is that I was afraid! In the beginning, I believed in an accident, a terrible accident, inasmuch the lights were so strong. But when I saw the being, I was afraid! I did not sleep because of that!" [A. Darcheville] - "And it is you who saw the being with the maximum of details since you were on the right side of the car, i.e. [the side] of the UFO?" [Mme Mozin] - "Oh! Yes, I saw him well. I still see him when I close my eyes!" [A. Darcheville] - "But, in the beginning of your vision, when you realized that this was not a car accident, what did you think of?" [M. Mozin] - "I thought of a flying saucer! They were discussed at the time. A gate-keeper of the S.N.C.F. [National railway company] had seen a saucer landing on railroad track [See Quarouble Oct. 10.]. I thus thought of a saucer. [A. Darcheville] - "Why didn't you want your husband to go back?" [Mme Mozin] - "Oh! no, I didn't want to! I didn't know what was going to happen. Moreover since the car's lights had dies out! Afterwards, when the car's light came back, I said: "No, no! No way we go back there!" [A. Darcheville] - Mr. Mozin, when did your engine start to function again?" [M. Mozin] - "It never stopped functioning!" [Mme Mozin] - "No, only the headlights went out." [A. Darcheville] - "For how long?" [M. Mozin] - "It's hard to say. During seventy to eighty meters. I had a new Aronde. It was a fast car!" [A. Darcheville] - "Without the headlights, did you get enough light?" [M. Mozin] - "Oh! Much more light than if the headlights had functioned!" [A. Darcheville] - "Were you alone on the road? No other car?" [M. Mozin] - "No. I was alone at this time. At midnight, there were not many cars which were driving, especially at that time, when there were much less cars than now. It was twenty years ago! But we would have loved to meet another vehicle, believe me!" [A. Darcheville] - "What was your occupation at that time, Mr. Mozin?" [M. Mozin] - "I was a butcher." [A. Darcheville] - "What were you doing so late on a deserted road?" [M. Mozin] - "I had gone to visit to a relationship which had just given birth. We had started from Maubeuge after my work, around 10 hours of the evening. We returned around 11 and a half, midnight. It is at the return trip that we saw the "thing"." It is a small and stoky being that the Mozin husbands saw inside a gigantic shell-shape, in November 1954. "- It resembled the Michelin man", they specified. Credit: The Nostra magazine articles for 1974 were scanned and shared on the web by ufologist Patrice Seray in 2011. The author indicates that there are cases with "Bibendum", the exact counterpart of the character which symbolized a tire brand, seen for example on October 18, 1954 in Fontenay (Oise) and in November 1954 between Avesne and Louvroie (Maubeuge). This humanoid has rolls around the arms. He is small (less than one meter), stocky, wears a helmet as broad as his shoulders. He was observed at a distance of four meters. The two authors indicate that at an unknown date of November 1954, at midnight, at the locality "Belle Hotesse", close to Beaufort, Mr. and Mrs. Mozin returned from a visit to a patient at parents in Dourlers and were driving on the N2 road in direction to Maubeuge. The road was deserted, and Mr. Mozin said to his wife: "Hold on, look at the gleams over there! One would say a serious accident." Driving at 120 km/h, they quickly crossed the distance which separated them from the craft posed between the road and the ditch. The craft was a cylindrical object ending in a cone of low height of a diameter which was to be two meters approximately, and a 2.30 to 2.40 meters height. It rested on three 30 cm high feet and comprised an opened door in its center. Its color was white metallized. They observed a being of 1 m 20 to 1 m 40, a sort of Michelin bibendum, carrying a helmet, which was visible, silhouetted in the opening. The inside was luminous and this light diffused on the road. They see what they supposed being pipes or large cables which went down in the craft, with kinds of handles or switches. The headlights of their car, a Simca Aronde, ceased functioning within 100 meters of the object. The engine did not stop. The driver slowed down close to the machine and it is rather slowly, at 70 km/h approximately, that they observed it. The headlights re-ignited without intervention afterwards. Mr. Mozin stopped in the intention to go to see the strange object more closely, but facing the insistence of his wife he resumed the trip towards their residence in Maubeuge. The authors note that J.-C. Bourret quotes in the report of Andre Darcheville that the witnesses would have been returning from Montournère but in fact they were returning from Mont-Dourlers. The authors indicate that the books by François Lagarde and by Jean-Claude Bourret are their sources. The author suggests that the humanoïd with the roved diving-suit is a French speciality inspired by the Michelin man. Because the two debunkers Gerald Barthel and Jacques Brucker had published that "the case was null" according to a journalist whom they had questioned, Jean-Marie Bigorne who had been the first investigator published a firm answer in the ufology magazine "Lumières Dans la Nuit." It indicates that Barthel and Brucker had wrongly taken this journalist for the investigator who had accompanied him in 1970 at the time of the first investigation by the witnesses. The journalist had simply given a negative but purely unaware opinion that Barthel and Brucker changed into a certainty. Jean-Marie Bigorne reminds that he was the principal interested, that he has seen the witnesses very closely for 10 years, to find a possible fault, and that Barthel and Brucker did not even consult him, whereas he would have facilitated their work of counter-investigation by bringing them on the location and to the witnesses. Jean Marie Bigorne charges on the relevance of their telephone investigations, blames them for not having gone to the site, not having met the witnesses and for not having worked objectively. For him, the case remains unidentified to date. Jean Sider indicates that the counter-investigation by Barthel and Brucker on the CE3 case in Beaufort ine the Nord, is "imaginary." He indicates that on Saturday, October 16, 1954 at abou midnight the Mozin couple drove by car on National Road 2 when their attention was caught by a gleam which proved to be emitted by a machine posed on the rim of the road. It had an opened door letting see a being of the "Michelin man" type. They note that on page 100 of their book, Barthel and Brucker write that they repeat to have made extensive investigations for each case where it was possible and that always, something came to disturb their "conviction" [they say they initially "believed"], and that in the case of Beaufort it is "the opinion of an investigator" who convinced them that the case was not serious at all. Jean Sider indicates that the investigator in question is in fact Jean-Marie Bigorne, correspondent of the Lumières Dans La Nuit magazine, customs inspector, and well-known investigator "experienced and well-known for honest spirit". Sider ensures that Barthel and Brucker confused him with a journalist friend of his, who merely delivered a negative and unargumented personal impression to them; which Barthel and Brucker "changed into a final truth", an "irrefutable proof of the lack of credibility of the incident." 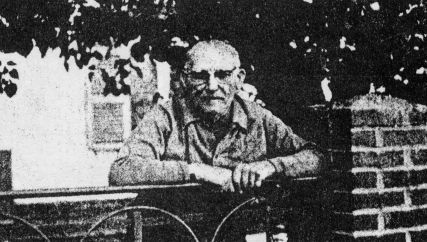 Jean Sider estimates that Barthel and Brucker did not even try to talk on location or by phone with Mr. Mozin, whereas the latter was still alive in 1979. He adds that Jean-Marie Bigorme on the contrary met him and all the details of the case were confirm, and that a photograph of Mr. Mozin as well as a correction appeared in LDLN #191 on page 34. M & Mrs Mozin were traveling to Maubeuge by car when they saw a light by the road ahead. As they approached, they saw that it came from the interior of an object shaped like a fat shell. This object was about 6 ft in diameter and 7.5 ft high, and rested on 3 1-foot legs. It was a whitish metallic color. A wide opening gaped in it on the side facing the road; within could be seen thick cables and a very stout space suited being about 4 ft tall, apparently about to step out. He was encased in "rolls" like the "Michelin tire man" and wore boots & a very broad helmet. His face was not seen. The Mozins passed within 15 ft of the object. The car's headlights went out when it came within 300 ft of the object, and came on again 300 ft past it. The next day, Mr. Mozin found an 8" carbonized spot "giving off an odor reminiscent to benzene" & surrounded by 3 imprints 4" deep, on a circle of about 4.5 ft diameter. The fact occurred around Maubeuge on the R.N. 2 (Paris-Brussels), between Avesnes (59) and Louvroil (59), Michelin map #53, fold 6. The Mozin couple had gone, this Saturday, November 16, 1954, to visit a patient at parents in Dourlcrs (59). About midnight, they were on the road of the return in direction of Maubeuge. The road was deserted, dry weather, rather frosty. It was daylight. They crossed kilometers briskly, when Mr. Mozin called to his wife: "Hey, look at the gleams over there! What is it? You would say" a serious accident!" They saw this gleam on the top of a small hill, approximately 800 meters of their car. Driving at 120 km./hour, they cross the distance quickly and arrived at the top. od the small hill, they discover within 100 meters from there, on the right edge of the R.N. 2. a craft posed, an open door and inside the craft a "Michelin man" appearing to move slowly on the threshold of the door. The craft, a kind of large shell, which rested on feet, had a metallic white aspect, kind of coated metallic sheet and on the walls of the visible, distant vertical lines between them of 10 cm. The approximately 1 m 20 tall being resembled the "Michelin man".. It was very large, with rolls around the arms and legs. Fitted with large boots. it carried a bulky helmet, almost as broad as its shoulders, which made him a large head. The light seen came from the opened door, and was diffused on the road. The inside was of an intense white not dazzling. The two witnesses saw there what they supposed being pipes, where large cab1es which went down in the craft with kinds of handles or switches. The Mozin couple managed to begin their observation a hundred meters before arriving near the object, where they passed in the immediate vicinity, i.e. at 4 or 5 meters. The headlights of the car ceased functioning as soon as they were at a hundred meters, at the time when the witnesses saw the object. The engine did not stop. The driver then slowed down, and it is more slowly than he crossed 1he craft: at 70 km./h. approximately. One hundred meters further, the headlights were suddenly re-ignited without his intervention. Mr. Mozin stopped with the intention to go to see the strange object more closely. At the insistence of his frightened wife, he continued his travel towards Louvroil and reached his Maubeuge home. The next day, a Sunday, going to Rheims to attend a soccer game with his friend Mr. Houssières (deceased), he stopped at the place of the landing to seek traces, and to prove to his incredulous friend that had not dreamed. Three prints were visible, and in the center of the triangle which they formed a carbonized round from 15 to 20 cm. of diameter was seen releasing an indefinable odor, a bit like benzine. The three traces, laid out on a circle of more or less 1 m 40 in diameter, was in the shape of a half-circle, deep from 8 to 10 cm. The spacing of the traces seemed smaller than the diameter of the craft evaluated as 2 meters. The machine was posed on a narrow space between the ditch and the road. All the friends of Mr. Mozin laughed a lot at what they thought of being an enormous joke and the gendarmerie did not intervene. The witnesses never forgot that night, it remained engraved for ever in their memory. Mrs. Mozin "suffered insomnia during eight days and always saw again "the Michelin man" at the foot of her bed. Each time that she crosses a gaz service station showing the Michelin advertisement she recalls their strange meeting to her husband. The credit to be granted to this account appears total. The Mozin couple is known in the vicinity for their kindness and their good moral and intellectual behaviour. They are simple people to whom a cat is a cat and a F.s. is a D.s.. They enjoy a very good sight and never had a serious illness. Sixteen years later, day for day, the witnesses lived again their adventure for us. Their account has notes of sincerity which would be quite difficult to imitate. They become again astonished, curious or apprehensive and contrary to her husband, his wife says that she would not like to see this again, so much frightened she had been by it. Some additions to the investigation. The craft was on the edge of the road, between the road and the 1 meter broad and 50 cm deep ditch. The car passed between 3 and 5 meters from there. Its form was cylindrical ended by a cone of low height. Its diameter was to be 2 meters approximately. and its height cone included 2 m.30 to 2 m. 40. It seemed to have undulations or vertical lines of approximately 10 cm distance between them. It comprised it seems an open opening, almost as large as the object, but no door was noticed only the opening. It rested seemingly only on two feet (there were three of them which actually were observed thanks to traces found). The traces were compared with those of a bath-tub feet. The height of the feet between the ground and the machine was evaluated as of 30 cm. The size of the occupant was to range between 1 m. 20 and 1 m. 40. It appeared very broad between 0 m. 90 and 1 meter. The arms were stuck to the body and close to the edges of the opening. Large boots broad feet, no memory of the hands. Large helmet almost as broad as the shoulders, nonapparent face. It appeared to move very slowly, by trailing the feet to move as if it wanted to come out. The witnesses did not attend the departure of the machine. The craft was located at a few meters near near a geodetic spot indicated on an 1/40.000th English map of 1918 with the denomination of "conspicuous trigono­metrical spot". The place was deserted at the time and at the crossing of two roads. Reference: Investigation by Mssrs. BIGORNE and MATHIEU L.D.L.N. 24:00 Between Avesne and Louvroil, around Maubeuge on the Road RN 2 which joins Paris to Brussels, on October 16, 1954, about midnight, a couple returned by car of a visit at relatives in Dourlers. The road was empty, the weather was close to cold and dry, the sky was clear, they drive at 120 kmh. The man draws the attention of his wife to gleams in the countryside, on top of a small coast, at a distance which they estimated as 800 meters of them. The witness indicates to his wife that it thinks that there was an accident. The distance is quickly crossed by the car and when they are at the top of the hill, they discover within 100 meters of them on the right side of the road a craft posed on the ground, which has a cylindrical form about two meters in diameter with a cone of low height at the top. The witnesses in the car managed to see that when their car was still at a hundred meters of the object, and at this time, the headlights of the car died out spontaneously while the engine continued to function normally. The driver however slowed down at this time and the speed of the car is brought back to 70 kmh. While continuing to drive, they arrived at some four or five meters of the object. From this distance, they can see that the object rests on feet. The feet seem to have about thirty centimetres in height. It has a white aspect like coated sheet and vertical lines separated by 10 centimetres on its wall. The machine has a broad opening, and in the framing of this one which seems deprived of door, a silhouette appears to move slowly and it will evoke for them the silhouette of the "Michelin man." This being seems to them high of one meter twenty, very large, broad of 0m90 by 1 meter, with rolls around the arms and legs, fitted with large boots and wearing a bulky helmet almost as broad as its shoulders. Its face is not apparent. It seems to move slightly and very slowly, like preparing to come out, by trailing its feet which appear fitted of heavy boots. Its hands are not distinguished. The luminosity of the opening is diffused on the road, the inside of the machine seems of an intense white not dazzling. Kinds of conduits or large cables go down in the machine in its inside and kinds of handles or switches are seen. When the car exceeded the object by a hundred meters, its headlights are re-ignited spontaneously. The driver stops the car then, decided to go to see the object closely by foot, but his frightened wife dissuades him and they resume the trip and reach home in Maubeuge. They thus do not attend the departure of the machine. The next day, the witness, while going to Rheims to attend a football game with a friend, stops at the place where he saw the object the day before to check if there are traces, hoping to prove to his friend that he had not dreamed In a narrow space between a one meter broad ditch and 50 centimetres of depth and the road, three prints in half rings and 8 to 10 centimetres deep were visible with in the center of the imaginary circle of approximately a meter forty formed by these three prints, a carbonized round 20 centimetres in diameter releasing an odor that the witness compared to bemzine odor. The source is indicated as "LDLN N.191, p.34". Luc Chastan indicates that in the Nord in Maubeuge on October 16, 1954 at 23:55 hours "Between Avesne and Louvroil, around Maubeuge on the Road RN 2 which joins Paris to Brussels, on October 16, 1954, about midnight, a couple returned by car of a visit at relatives in Dourlers. The road was empty, the weather was close to cold and dry, the sky was clear, they drive at 120 kmh. The man draws the attention of his wife to gleams in the countryside, on top of a small coast, at a distance which they estimated as 800 meters of them. The witness indicates to his wife that it thinks that there was an accident." "The distance is quickly crossed by the car and when they are at the top of the hill, they discover within 100 meters of them on the right side of the road a craft posed on the ground, which has a cylindrical form about two meters in diameter with a cone of low height at the top." "The witnesses in the car managed to see that when their car was still at a hundred meters of the object, and at this time, the headlights of the car died out spontaneously while the engine continued to function normally. The driver however slowed down at this time and the speed of the car is brought back to 70 kmh. While continuing to drive, they arrived at some four or five meters of the object. From this distance, they can see that the object rests on feet. The feet seem to have about thirty centimetres in height. It has a white aspect like coated sheet and vertical lines separated by 10 centimetres on its wall. The machine has a broad opening, and in the framing of this one which seems deprived of door, a silhouette appears to move slowly and it will evoke for them the silhouette of the "Michelin man." This being seems to them high of one meter twenty, very large, broad of 0m90 by 1 meter, with rolls around the arms and legs, fitted with large boots and wearing a bulky helmet almost as broad as its shoulders. Its face is not apparent. It seems to move slightly and very slowly, like preparing to come out, by trailing its feet which appear fitted of heavy boots. Its hands are not distinguished." "The luminosity of the opening is diffused on the road, the inside of the machine seems of an intense white not dazzling. Kinds of conduits or large cables go down in the machine in its inside and kinds of handles or switches are seen." "When the car exceeded the object by a hundred meters, its headlights are re-ignited spontaneously. The driver stops the car then, decided to go to see the object closely by foot, but his frightened wife dissuades him and they resume the trip and reach home in Maubeuge. They thus do not attend the departure of the machine. The next day, the witness, while going to Rheims to attend a football game with a friend, stops at the place where he saw the object the day before to check if there are traces, hoping to prove to his friend that he had not dreamed In a narrow space between a one meter broad ditch and 50 centimetres of depth and the road, three prints in half rings and 8 to 10 centimetres deep were visible with in the center of the imaginary circle of approximately a meter forty formed by these three prints, a carbonized round 20 centimetres in diameter releasing an odor that the witness compared to bemzine odor." The source is noted "Les OVNI vus de près by Gross Patrick ** http://ufologie.net". Luc Chastan indicates that in the Nord in Beaufort in November 1954 at 00:00, "A couple circulates on the N2 coming from Dourlers and going towards Maubeuge. A little before the place called "Belle Hôtesse", the man observes a gleam, thinking of an accident. The car goes at 120 km/h, they arrive at the level of the gleam and then observe a cylindrical object finished by a cone of low height of a diameter estimated aa 2 meters and a height of 2m30 to 2m40. It rests on three feet of 30 cm heightt. An open opening is visible in its center. The object iso f metallized white color. In the medium of the opening lit by a light coming from the inside, they observe a being of 1m20 to 1m40 resembling a Michelin bibendum and helmeted. Pipes or bigg wires are visible with kinds of handles or switches. At a hundred meters of the object the headlights of the vehicle stop. The driver slows down, the car passes the object, the headlights are re-ignited. The driver stops, wanting to go to see closser, but his wife prevents him to, and they drive away." The author indicates that on 16 October 1954 at 23:40 in Beaufort, France, "Bullet-shaped UFO lands on three legs in ditch. Lights are turned off. Figure exits." And: "Close encounter with a an unidentified craft and its occupants. One bullet-shaped object was observed by two witnesses in a pasture for over three minutes." The sources are noted as Vallee, Jacques, Computerized Catalog (N = 3073); Hatch, Larry, *U* computer database, Author, Redwood City, 2002. The website indicates that in November 1954 at 24:00 Maubeuge, Nord, France, "M and Mrs Mozin were traveling to Maubeuge by car when they saw a light by the road ahead. As they approached, they saw that it came from the interior of an object shaped like a fat shell. This object was about 6 ft in diameter and 7.5 ft high, and rested on 3 1-foot legs. It was a whitish metallic color. A wide opening gaped in it on the side facing the road; within could be seen thick cables and a very stout space suited being about 4 ft tall, apparently about to step out. He was encased in "rolls" like the "Michelin tire man" and wore boots and a very broad helmet. His face was not seen. The Mozins passed within 15 ft of the object. The car's headlights went out when it came within 300 ft of the object, and came on again 300 ft past it. The next day, Mr. Mozin found an 8" carbonized spot "giving off an odor reminiscent to benzene" and surrounded by 3 imprints 4" deep, on a circle of about 4.5 ft diameter." The source is a link to a non-existing web page. The website indicates that on 6 January 1954 in Eauforte, France, there was a "Close encounter with a an unidentified craft and its occupants. An unidentified object at close range and its occupants were observed by two witnesses on a road (Mozin)." The source is noted as Webb, David, HUMCAT: Catalogue of Humanoid Reports. Donald Johnson indicates that in 1954, there was one report of a "Michelin Man" uniform which would occur in subsequent years. Mr and Mrs Mozin were driving back to Maubeuge from Montourners, when, as they reached the ‘Belle Hotesse’ inn, they saw some very bright lights by the side of the road, about 2km away. Thinking it was an accident, they hurried to the scene at 120kph. Suddenly, at a distance of 100m or so from the spot, the car lights went out. 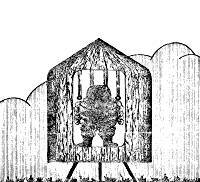 Silhouetted in a doorway in a cigar shaped machine, 3m long, was a little man, 1.3m tall. He was dressed in a very big helmet, with big gloves and boots, and a “Michelin Man” suit. The being walked towards them, with a clumsy gait, like that of a diver. From the 1.8m high doorway came a light that illuminated the countryside. Through the opening they saw various controls and wires. The couple drove rapidly away, and 50m on, their lights came on again. The observation perhaps lasted for only 10 seconds. Bourret 1977, p.81, citing Andre Darchville. M & Mrs Mozin were traveling to Maubeuge by car when they saw a light by the road ahead. As they approached, they saw that it came from the interior of an object shaped like a fat shell. This object was about 6 ft in diameter and 7.5 ft high, and rested on 3 1-foot legs. It was a whitish metallic color. A wide opening gaped in it on the side facing the road; within could be seen thick cables and a very stout space suited being about 4 ft tall, apparently about to step out. He was encased in “rolls” like the “Michelin tire man” and wore boots & a very broad helmet. His face was not seen. The Mozins passed within 15 ft of the object. The car’s headlights went out when it came within 300 ft of the object, and came on again 300 ft past it. The next day, Mr. Mozin found an 8” carbonized spot “giving off an odor reminiscent to benzene” & surrounded by 3 imprints 4” deep, on a circle of about 4.5 ft diameter. Investigator Jean-Marie Bigorne has photographed Mr. Mozin in May 1979 while he interviewed him again. [bi1] Investigation report by J.M. Bigorne, in the ufology magazine Lumières dans la Nuit (LDLN), France ("Lights in the Night"), #191, page 34. [fl1] "Mystérieuses Soucoupes Volantes", book by LDLN with François Lagarde, Albatros publisher, pp 119-122, 1976. [fi1] Interview of Mr. and Mrs Mozin by André Darcheville, France Inter radio, 1974. [no1] "Les Mystérieux Passagers des Soucoupes Volantes"", article in the sensationalist magazine Nostradamus ("Nostra"), France, #92, page 12, January 10, 1974. [hj1] "Chasseurs d'OVNI", book by "François Gardes", pseudonyme of Henri Julien, Albin Michel publisher, France, page 150, 1977. [fr1] "OVNI - Premier Dossier Complet des Rencontres Rapprochées en France", book by Michel Figuet and Jean-Louis Ruchon, Alain Lefeuvre publisher, France, pp 206-207, 1979. [jo1] "Et si les OVNIS n'existaient pas? Et si Michel Monnerie n'avait pas tout à fait tort? ", article by Jacques Scorneaux in Lumières Dans La Nuit (LDLN), France, ufology magazine, #177, page 9, August/September 1978. [ld1] Lumières Dans La Nuit (LDLN), France, ufology magazine, #191, page 34, January 1980. [js1] "Le Dossier 1954 et l'Imposture Rationaliste", book by Jean Sider, Ramuel publisher, France, pages 19,25, 1997. 0.1 Patrick Gross April 17, 2006 First published. 1.0 Patrick Gross December 28, 2009 Conversion from HTML to XHTML Strict. First formal version. Additions [jb1], [lc1], [ud1]. 1.1 Patrick Gross February 14, 2010 Addition [tp1]. 1.2 Patrick Gross February 28, 2010 Additions [ud2], [dj2]. 1.3 Patrick Gross March 8, 2010 Addition [lc2]. 1.4 Patrick Gross March 18, 2010 Additions [hj1], [ud3]. 1.5 Patrick Gross July 9, 2010 Addition [dj1]. 1.8 Patrick Gross October 19, 2011 Addition [no1]. 1.9 Patrick Gross August 14, 2013 Addition [pr1]. 2.0 Patrick Gross January 12, 2017 Additions [ta1], [ub1]. This page was last updated on January 12, 2017.